Play Mahjong Solitaire on Windows. Mahjong Epic features 100 different boards for you to play on. In addition, you can design your own boards and play them! With an intuitive and easy to use interface, and unlimited undo and redos. 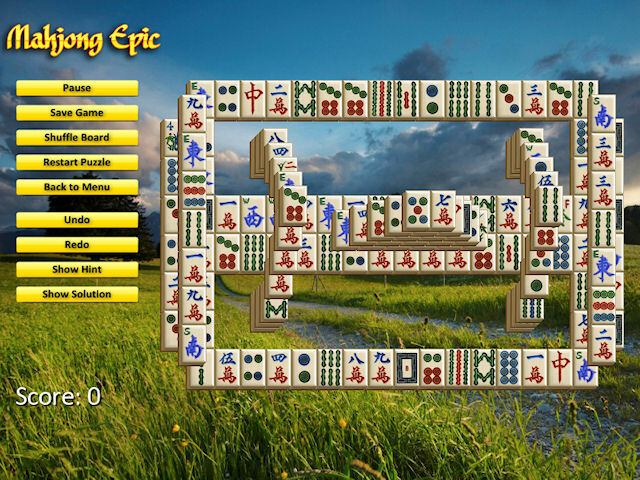 Mahjong Epic game features beautiful graphics and music that make you enjoy the game of Mahjong even more. Additionally you can save your game or create your own boards, and watch the solution to every board. An easy-to-learn but tough-to-master puzzle game. Qweas is providing links to Mahjong Epic 1.52 as a courtesy, and makes no representations regarding Mahjong Epic or any other applications or any information related thereto. Any questions, complaints or claims regarding this application Mahjong Epic 1.52 must be directed to the appropriate software vendor. You may click the publisher link of Mahjong Epic on the top of this page to get more details about the vendor.